C'an March is a large villa that will comfortably sleep 6 people. The villa is completely detached and has no neighbours, making it an idyllic 'get away from it all' holiday location. This is the Mallorca of calm and beauty. We like staying here because - : Relaxing rural setting just 5 mins drive from the beach resort of C'an Picafort on the North coast of Mallorca. Villa C'an March is an ideal self catering vacation choice which provides the opportunity to do as little or as much as you like. If this property looks interesting PLEASE CLICK HERE for a summary page about this villa rental to BOOKMARK - ADD TO FAVOURITES - for future reference. It's printable so that you can show the family . . . Please follow the link to the full details before making an enquiry or booking. Luxury 2 bed apartment furnished to high standards with 2 bathrooms, fully fitted kitchen, air conditioning/heating, sleeps 4-6 people on a quiet complex with well kept gardens and pool which is close to beaches, shops and restaurants in Cala Dor. We like staying here because - : Just look at the full details page . . . and you won't have seen a group of hoiday apartments so spectacular anywhere else! If this property looks interesting PLEASE CLICK HERE for a summary page about this apartment for rent to BOOKMARK - ADD TO FAVOURITES - for future reference. It's printable so that you can show the family . . . These three beautiful town houses situated at the outskirts of Cala D’Or offer a quiet location where to relax by the pool or the sun roof terrace, yet they are close to the thriving day and night live of the very popular resort. If rented together the town houses are ideal for large parties as they can cater for 20+ people. With an 18 hole golf course, “Vall D’Or”, just 3 minutes drive away, a natural park, “Mondrago”, and an endless number of “calas” within a 5km radius, you are never short of activities, from water skiing to mountain walking. Enjoy the beauty of the island whatever the season, as the properties are fully equipped with central heating and air-conditioning, and for your comfort with a dishwasher and everything else that you may need. Full details page has nice photos of the area. If this property looks interesting PLEASE CLICK HERE for a summary page about this holiday houses - can be used as one large villa for rent to BOOKMARK - ADD TO FAVOURITES - for future reference. It's printable so that you can show the family . . . Traditional Spanish style villa with detached annexe, fully renovated, set in large gardens surrounded by walls and hedges. Approached via a long drive bordering the orchard. Pool with large patio and barbecue. Ample outside lighting for that evening meal and swim. Full length veranda and grapevine provides shade to one side. Furnished roof terrace. Location: 18 kilometres from airport, near unspoilt town of Algaida. The property is in a very rural unspoilt yet convenient location. We like staying here because - : Centrally placed on the island - choice of a quiet holiday however beaches, golf courses,water sports and Palma all within a 30 minute drive. If this property looks interesting PLEASE CLICK HERE for a summary page about this villa with pool for rent to BOOKMARK - ADD TO FAVOURITES - for future reference. It's printable so that you can show the family . . . PORT d'ANDRATX - MALLORCA Delightful south facing holiday apartment to rent directly on the beach in exclusive Port d’Andratx, with superb sea and harbour views, sleeps 4. Port d’Andratx is an exclusive resort in the southwest corner of Mallorca, undiscovered by package holiday tourists, set in a beautiful natural bay with a backdrop of rugged mountains and a sunny microclimate. 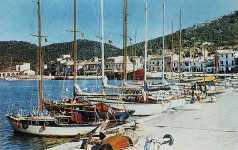 The Port has a thriving fishing fleet based in the harbour, an excellent yacht marina and a fine golf course and tennis courts less than 10 minutes drive away. Our spacious two bedroom / two bathroom apartment on the beach is in a peaceful location making the apartment a perfect place to unwind and relax, yet only a short distance from the excellent restaurants and cafes for which Port d’Andratx is renowned and is a perfect base for water sports. You can enjoy the sunshine and unrestricted sea and harbour views from the privacy of your own balcony all day long – throughout the year. The apartment building has its own waterfront terrace with steps directly into the sea and easy access to the pretty little adjacent beach. When requesting further information, please confirm party size and a contact telephone number – thank you. Sorry, no children under 10 years. We like staying here because - : Of our peaceful location and lovely sea views, in an exclusive area unknown to the package holiday brigade! If this property looks interesting PLEASE CLICK HERE for a summary page about this apartment rentals to BOOKMARK - ADD TO FAVOURITES - for future reference. It's printable so that you can show the family . . . 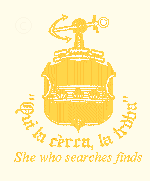 If you are taking young children, or older relatives, on holiday with you, Casa Carina is a perfect place to stay. There are no stairs on the property at all, and because of its location it's pretty good for teenagers too. The house is only a short walk into the Puerto de Andratx, so young people can be independent and you can be left alone to enjoy yourselves in peace and quiet by the pool in this very pleasant house and garden. If this property looks interesting PLEASE CLICK HERE for a summary page about this villa to rent to BOOKMARK - ADD TO FAVOURITES - for future reference. It's printable so that you can show the family . . .
A superbly positioned selection of 3, 2 and one bed apartments with pool. A moments walks to the sandy beaches, shops, bars and restaurants Cala Dor has to offer. The wonderful marina is a 10 min walk away where you can eat and watch the luxury yachts go by. Each apartment is furnished to high standards and has a/c and heating for the winter period, satellite TV, fully fitted kitchens, terrace with table chairs and BBQ area in secluded gardens. If this property looks interesting PLEASE CLICK HERE for a summary page about this appartment rentals to BOOKMARK - ADD TO FAVOURITES - for future reference. It's printable so that you can show the family . . .
We like staying here because - : The View from the terrace is outstanding , the location is perfect, the marina is easily accessable, beaches are easily reached,Cala D'or centre is near enough to be convenient yet far enough to not be a disturbance. The development is small, and exclusive. A magnificant 5 bed well furnished villa with its own large pool, sauna, and gardens which is located a few mintues from the beaches, marina, and restaurants in Cala D'or. Excellent market entry studio for sale at a knockdown price. Family circumstances force sale. Best bargain in Western Europe! The studio will sleep two adults and up to four children (or people up to about 8 stone). The accomodation, being a studio, is all-in-one open plan. Furniture is pine and the sofabed is top range. There is a porter on duty, and night security, and the apartment is serviced by a cleaner, electrician and plumber if anything goes wrong. 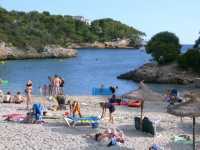 The beaches are five minutes down the cliff steps from the apartment block, called 'Bahia de Palma'. This was the original aparthotel of the resort, but is now owned privately, mostly by nationals wanting to live near the sea and work in the city, and a handful of foreigners and mainland Spaniards who have holiday apartments there. Five minutes walk from beaches and there are several coves to explore. The Royal BendinaGolf Course a 20walk or a short car drive behind the complex. There are schools and shops nearby. Public transport is frequent and close taking you into Palma city centre in about 20 minutes, and from there you can visit the whole island on the excellent train and bus routes. We like staying here because - : It's convenient and a wonderful holiday pad for you to enjoy yourselves or possibly let for holidays at a bargain price. If this property looks interesting PLEASE CLICK HERE for a summary page about this apartment for sale to BOOKMARK - ADD TO FAVOURITES - for future reference. It's printable so that you can show the family . 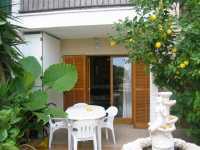 . .
A lovely family villa ideally situated for holidays in a quiet residential part of Alcudia. Alcudia is on the East coast of Mallorca, just along from Pollensa and under an hours drive from the airport. Alcudia is a family resort with plenty to occupy all ages. The villa has three bedrooms, two new bathrooms, a new kitchen (both spring 2004) and lounge with log fire. Garden patio area for outside dining! Very close to all the amenities and most importantly the beach. Prices are from £300 per week in the off season to a maximum of £500 per week in August. Sleeps six people. We rent from Tuesday to Tuesday all year round to keep flight prices down but sometimes we can accomodate other requests. Also short long weekends in the sun can be accomodated. Book Early!!!! We like staying here because - : Alcudia is a friendly family resort with plenty for all and a fantastic beach!! This comfortable 2 bedroomed apartment with partial air-conditioning is located in a quiet area of Santa Ponsa but close to all the amenities. Around the large beach with sun beds, umbrellas and palm trees is a lovely promenade that goes all around the coastline. 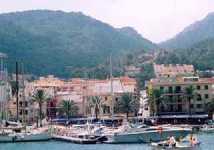 In Santa Ponsa can be found many shops, bars and restaurants of all types and price ranges. On the main beach the Tourist Office can organise excursions to places of interest such as the Cuevas del Drach, La Granja or one of the local markets held on the island. For families there are the wonderful themed Waterparks, Go-karting, the Pirates Adventure & show and the amazing Marineland. 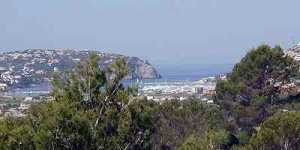 Also Santa Ponsa can boast 3 Championship Golf Courses and many others within a short drive. We like staying here because - : The apartment is well based for all the fun the area has to offer or for doing absolutely nothing at all! If this property looks interesting PLEASE CLICK HERE for a summary page about this Apartment rental to BOOKMARK - ADD TO FAVOURITES - for future reference. It's printable so that you can show the family . 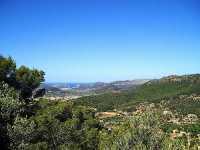 . .
Las Alcovas is situated just behind the Port of Port D'Andratx, elevated with views across the Port and Mountains beyond and only a few minutes walk down to the water, bistros, shops and bars. The property is of a high standard and fully equipped with a large terrace for al-fresco living. Port D'Andraitx attracts a very cosmopolitan mix of people coming to an area that is truly a jewel in the Mediterranean. Many activities and attractions are on the doorstep of Port D´Andratx, which include; great nearby beaches, golf at Golf D´Andratx, walking, sight seeing, breath-taking scenery, fine dining in a multitude of restaurants, bars, shopping or just relax on the terrace with a glass of wine and let the world go by! The American style kitchen overlooks the lounge room, which is air-conditioned, double doors opening onto the terrace, dining table, sofas, music system, television, Satellite and DVD player. It's ideally suited for all that Mallorca has to offer for a good holiday. We like staying here because - : A high quality apartment in a quiet area with everything at your doorstep. To experience this unique and very wonderful part of Mallorca if only for a short time, but there is always next year! If it's peace and quiet you're looking for, sun and sand, mountains and unspoilt scenery, the sound of waves breaking on rocks, loads of activities for children, lazing by a gorgeous, large, uncrowded pool, delicious Mallorcan cuisine on your doorstep, golf, painting, birdwatching, rambling, snorkelling - look no further, it's all here! Our luxury ground-floor apartment has two bedrooms, large fully-fitted kitchen and living area with sofa bed, own beautiful garden area with patios, it's secure and safe, frontline to the sea and sleeps six. There's a picturesque little fishing port down the road with shops, bars, restaurants, banks and lovely beach and just a short walk to the local bar and restaurant in the village. It's just idyllic! We like staying here because - : the complex is small and exclusive, there are beautiful views and scenery, it's frontline to the sea and, while it's quiet, peaceful and relaxing on the complex, there's lots to do very nearby. If this property looks interesting PLEASE CLICK HERE for a summary page about this holiday apartment rental to BOOKMARK - ADD TO FAVOURITES - for future reference. It's printable so that you can show the family . . . Fully equipped to cater for 4 people. Consists of: lounge/diner with double sofa bed; twin bedroom; large bathroom with shower over bath; compact kitchen with double hob, microwave and small electric oven. Television, video, telephone and safe. There are a swimming pool and bar on site. The beach is very near and there are plenty of shops, bars and restaurants within a few minutes walk. Price Guide (From - To) -: Sale price £12,500 for 1/6th share giving 2 months exclusive occupancy. We like staying here because - : the ideal location of the apartment and its stunning views help to create a relaxing atmosphere in the sunshine. Available for 2 months per annum on a rotational basis. If this property looks interesting PLEASE CLICK HERE for a summary page about this appartment for sale to BOOKMARK - ADD TO FAVOURITES - for future reference. It's printable so that you can show the family . . . The property is a simply furnished 2 bedroom apartment which can sleep 5 people. It sits on the seafront and is in a small complex which has large garden a pool (including a childrens pool)a resturant as well access to the sea. It is in the very quiet and green Illetes area. Palma is minutes away. The nearby beach has been rated by the Sunday times as one of the best 10 in the world. There is a golf course 5 minutes away and the location has a the feel of a small town or village with many small bars and resturants. There are beautiful veiws from the terrace of the resturant over the sea and the bay of Palma. Reccomended also as a location for those with small children. Tramuntana is a spacious, family home in the hills of Andratx. The mountain views are stunning and to the South you can see to the Port of Andratx beyond the valley below. The house is very comfortable and has a large open plan sitting room and dining area. With its log fire and central heating you can be warm and cosy even in the winter months. All the beds are interior sprung with good quality linen used and the kitchen is well equipped with family sized American fridge, washing machine and tumble dryer. Tramuntana has its own well and this is reflected in the lushness of the garden. The pool is 6m x 12m and is well maintained by Julio who also tends the garden. We like staying here because - : The views are fantastic and the house is perfect for a wonderful holiday. [Please go to the page to see full details) - and with the huge garden there's space for all the family . . . If this property looks interesting PLEASE CLICK HERE for a summary page about this large villa for rent to BOOKMARK - ADD TO FAVOURITES - for future reference. It's printable so that you can show the family . . .
3-bedroom beach villa for 6 set just behind the marina in the seaside village of San Pedro. We like staying here because - : Villa Regalat is perfect for those looking for a relaxing beach holiday away from any of the main resorts. Directly in front of the villa across a quiet road you find the Marina and sea, behind the villa you look straight on to the mountains of Arta. If this property looks interesting PLEASE CLICK HERE for a summary page about this villa for rent to BOOKMARK - ADD TO FAVOURITES - for future reference. It's printable so that you can show the family . . .
Set among the fields and peaceful countryside of rural inland Mallorca, the farm of C'an Domingo is the perfect base for a relaxing holiday away from it all. There are no neighbours and its terraces have unobstructed views. A special sunset terrace looks out towards the Tramontana mountain range. If this property looks interesting PLEASE CLICK HERE for a summary page about this villa - farmhouse rental to BOOKMARK - ADD TO FAVOURITES - for future reference. It's printable so that you can show the family . . . 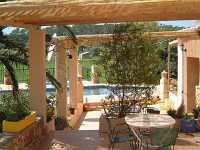 Son Torreta is a really lovely villa and is situated between the village and the port of Andratx. It is a very well equipped house and is maintained to a high standard. The views from the front of the house are towards the sea and to the back is the Tortuga turtle mountain. It is a family home and this is reflected in the comfort of all the rooms. The pool area is particularly nice and is a wonderfully relaxing place to just wind down and soak up the sun. Do ask us for a winter quote; the owner much prefers his house to be used and enjoyed by you, so it may not be as expensive as you think! We like staying here because - : Peace, tranquility, blue sky, blue water and sunshine! 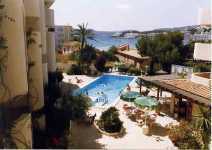 Spacious one bed luxury apartment sleeping 2-4 on small complex with large pool, jacuzzi and waterfalls in Cala D'or. Furnished to a high standard havings satalite TV, DVD player, Air conditioning, fully fitted kitchen with dishwasher, oven, microwae, washing machine. Luxury bathroom. The apartment is a moments walk from the sandy beaches, shops and restaurants in the area making it an ideal location to relax and enjoy. If this property looks interesting PLEASE CLICK HERE for a summary page about this apartment to rent - a louer to BOOKMARK - ADD TO FAVOURITES - for future reference. It's printable so that you can show the family . . .
Can Pax is a beautiful three bedroom villa with large private lawned garden and pool with roman steps(8mx4m). Sleeps up to 6 people. It's situated in the North of Majorca, between Pollensa, Cala Sant Vicente and Puerto Pollensa, 5 minutes driven to the beach. Formentor is also 10 km from Can Pax and It's one of the best places to visit in Mallorca. The villa is situated in a very quiet and peaceful place, but very well comunicated. A large supermarket is just one mile away. The villa offers the following facilities: single storey, spacious lounge / dining room with satellite TV, two full bathrooms, barbecue and sun terraces, fitted kitchen with hob, oven, microwave, dishwasher, fridge/freezer, utility room with washing machine, central heating... Maid service: cleaning the house and changing bed linen on Saturdays, changing bath towels and garden maintenance on Wednesdays and Saturdays. If this property looks interesting PLEASE CLICK HERE for a summary page about this Splendid villa for rent to BOOKMARK - ADD TO FAVOURITES - for future reference. It's printable so that you can show the family . . .
Quaint family villa sleeps 5 with pool . Beautiful location. 5 minutes walk to shops and harbour. 2 beds. Large pool suitable for young children or non-swimmers. 2 bathrooms. Large sunbathing area - secluded and quiet. BBq terrace. We like staying here because - : Its first class position in an up market area of Mallorca. Superb restaurants. Wonderful weather and nearby beaches. Lots of sailing and watersports. If this property looks interesting PLEASE CLICK HERE for a summary page about this private family villa for rent to BOOKMARK - ADD TO FAVOURITES - for future reference. It's printable so that you can show the family . . .
Beautiful 3 bedroom house right on the waters edge. Over looking the important Mallorcan National Park Island of Dragonera, home to the legendary pirate, Barbera Rosa or Red Beard. San Telmo is a village with all the facilities needed for a peaceful holiday, superb restaurants, bustling local bars, 2 beautiful natural beaches with calm shallow sea which is safe for children, and a small flotilla of local fishing boats. There are also 2 local 'supermarkets', 3 bread shops, a bank and a pharmacy. The village is a tourist resort but is un-touched by the ravages of commercialism and package holidays, many wealthy Mallorcans have second homes in San Telmo. We like staying here because - : The view from the lounge, 2 of the bedrooms, the garden and terrace and the huge roof terrace. After more than 5 years of owenership I still stand and look for hours. If this property looks interesting PLEASE CLICK HERE for a summary page about this house on water's edge to rent to BOOKMARK - ADD TO FAVOURITES - for future reference. It's printable so that you can show the family . . .
3-bedroom luxury villa for 6 set in Mallorca's untouched countryside. Sa Pleta has been designed and built by a famous local architect and you can clearly see the impressive results. Click through to the full details page for photos of this wonderful place. We like staying here because - : The villa is of an exceptional standard and the area is ideal for walking, cycling and just getting away from it all.. If this property looks interesting PLEASE CLICK HERE for a summary page about this Cottage to rent to BOOKMARK - ADD TO FAVOURITES - for future reference. It's printable so that you can show the family . . . Approached up a small rural lane in untouched countryside and set behind large gates, it becomes clear from the moment you arrive that you will be guaranteed a relaxing break far from the maddening crowd. We like staying here because - : Beautiful walks start from the doorstep, through rolling fields scattered with farms, forests and numerous country and village restaurants that are waiting to be discovered. If this property looks interesting PLEASE CLICK HERE for a summary page about this to BOOKMARK - ADD TO FAVOURITES - for future reference. It's printable so that you can show the family . . .
Set within beautiful gardens our spacious apartment has stunning sea views from the lounge, balcony and master bedroom whilst the second bedroom gives views of the mountains. The complex offers a large outdoor pool with seperate childrens pool, indoor pool, fully equipped gym and sauna. The area is renowned for its many idyllic walking trails, bird watching, fishing, cycling, unspoilt beaches and not least of all the five excellent Golf courses close by. The apartment is furnished and equipped to a very high standard and includes En- suite bathrooms to both bedrooms, TV, DVD, dishwashwer, full air conditioning (hot&cold) for year round comfort. We like staying here because - : We love to spend our holidays here experiencing Mallorcan life,sampling local cuisine and enjoying the peace and tranquility the area has to offer. Villa El Pinar, a four bedroom spacious villa, set outside the sleepy village of Esporles. The villa has an impressive private entrance and is surrounded by mountains. This villa is an ideal place to explore the South of Mallorca; Palma (the capital of the island) is only 5 kilometres away. The villa has been carefully designed to ensure maximum peace and tranquillity can be enjoyed. 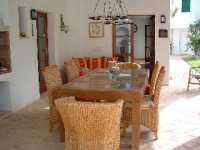 Splendid furnished villa in the south-west of Majorca at the seaside with direct access to the sea. Much comfort, swimming pool, chimney, garage, several terraces, conditioning air, ground of marble,3 bedrooms,2 bathrooms,big livingroom.Capacity 6 persons.Prices per weeks: January to May :1,075 Euros / June to July :1,290 Euros / August : 1,500 Euros / September to October :1,290 Euros / of November to December: 650 Euros. (all expenses included). This villa has an independent furnished apartment for 6 persons more wich can be rented by separatly. Is has is own entrance and terraces. Calm and quiet zone near the little port with tipicals restaurants. Near the villa, you can rent boats, and make deep-sea diving. If this property looks interesting PLEASE CLICK HERE for a summary page about this Villa for rent and for sale to BOOKMARK - ADD TO FAVOURITES - for future reference. It's printable so that you can show the family . 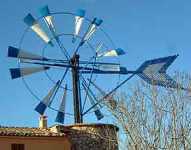 . .
A traditional windmill, restored in 2003, tucked away in a secluded sub tropical setting just 5 kms from the resort of C'an Picafort. Pollensa golf course is only 40 minutes away and the Pula golf course is only 45 minutes away. If a beach holiday is not all you are looking for, you will have easy access to inland rural Mallorca, here you will discover many of the off the beaten track villages including Muro and Santa Margalida. You will be able to mix with locals at the markets, Muro on Sunday, Santa Margalida on Saturday and Sineu on a Wednesday. We like staying here because - : A terrace divides the two separate living areas of this villa, making it a perfect choice for groups who appreciate a little extra privacy and personal space on holiday. C'an Picafort is an ideal location to discover not only the North of Mallorca including Pollensa and Formentor (only 30-40 mins drive) but the East Coast resorts of Sa Coma, and Cala Bona are only 45-50 mins away. If this property looks interesting PLEASE CLICK HERE for a summary page about this villa to rent - a louer to BOOKMARK - ADD TO FAVOURITES - for future reference. It's printable so that you can show the family . . .